Welcome to the Delta District 16 AHEPA Family web site. AHEPA was founded on July 26, 1922 in response to the evils of bigotry and racism that emerged in early 20th century American society. It also helped Greek immigrants assimilate into society. Today, AHEPA brings the ideals of ancient Greece, which includes philanthropy, education, civic responsibility, and family and individual excellence to the community. Although a majority of the membership is composed of Americans of Greek heritage, application for membership is open to anyone who believes in the mission of AHEPA. To learn more about AHEPA, visit AHEPA National. Download the membership application to join. 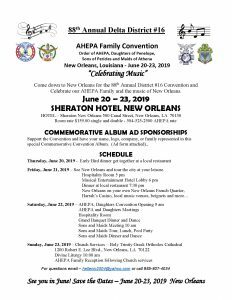 2019 District Convention will be in New Orleans LA on June 21-22.